It will be 100 years on 11th November this year since the end of World War I. The Great War, and also known, wrongly with hindsight, as the War To End All Wars. This horrific bloodbath took the precious young lives of more than nine million soldiers while a further 21 million were wounded. 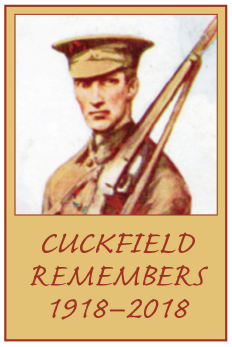 Cuckfield at that time had a population of around 2,000. Of the 462 men went to the war, 81 never returned. We will remember them here in Cuckfield at all times, but especially on the century weekend in November. Plans are already underway for memorial activities. Our beautiful churches, Holy Trinity and the Baptist Church, will provide ideal venues for a community concert and performances by our local thespians. There is even a special anthem being written by two gifted members of our community in preparation to commemorate this anniversary. The well documented Christmas Eve football match between ‘the enemies’ might well be re-enacted, and a tea dance set up in the Queen’s Hall, inviting couples to waltz and foxtrot, tango and one-step to dance music of the time, then glide gracefully to feast on always fashionable tea and cake. Watch out for a trail of photographs of First World War soldiers around the village and the lit portraits that will be on display in the heart of the High Street. It could be your house that hosts one of these memories, as history, carefully stored in Cuckfield Museum, reveals past lives of both men and women from the village who contributed significantly to the war effort. As darkness falls on Sunday 11th November, the village will join the rest of the country by lighting our beacon to commemorate the end of this war a century ago and remember those who sacrificed their lives for us in this brutal conflict. Your help and support is still much needed. • Have you any ideas of ways in which to remember? • Would you be prepared to join the organising party? • Did you have a relation who was involved in the war? • Would you like to share your family history and remember with pride the way in which those past relatives were both sung and unsung heroes?